Soft enamel pins, custom made to order at Awesome value! 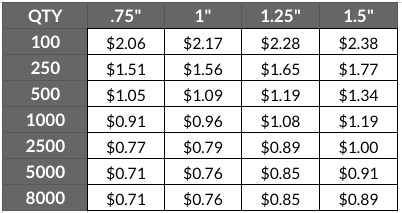 - Select - 0.75" 1" 1.25" 1.5"
If you would like to order more than one design, you will need to place each design as it's own separate order with a minimum of 100 per design. High quality soft enamel pin badges, custom made to your requirements at awesome value. Turn your digital art into wearable art! Show off your designs on the backpacks, jackets or caps of your trusty fans! Larger runs of soft enamel pins are also great to use as promotional giveaways or small rewards for charity fundraising. Soft enamel badges are made by stamping your designs into your chosen plating before filling the gaps with colored enamel that is Pantone matched to your artwork. When designing your artwork, remember that colors need to be separated by border (thin line of raised metal) to prevent them running into each other. If you would like to order more than one enamel pin design, we can do this is not a problem! When making your orders, you will need to place each design as it's own separate order with a minimum of 100 per design. Standard turnaround on enamel pin badges is around 4 weeks after your order has been approved. Clearly indicate which areas of your design you would like filling by using the correct color values along side your artwork - we recommend Pantone Solid Coated guide.